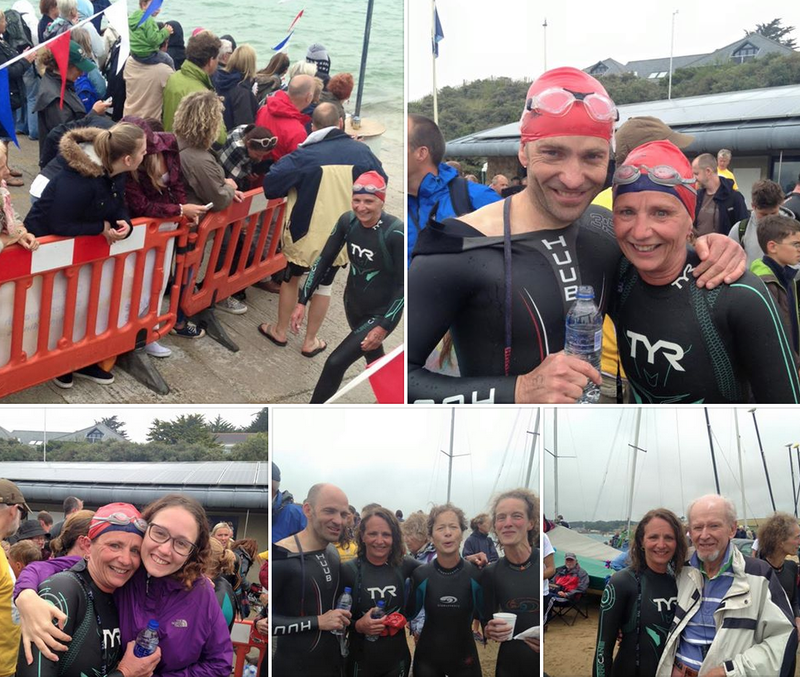 On Sunday 12 July, we joined the wetsuited throng on the quay at Padstow, Cornwall for the annual Padstow to Rock Swim in aid of Marie Curie Cancer Care. Padstow and Rock lie on opposite sides of the Camel Estuary in North Cornwall. Once a transatlantic port with boats sailing to Canada, Padstow is now best known as a tourist destination and seat of Rick Stein’s seafood empire. After the safety briefing (no mention of the estuary’s infamous ‘Doom Bar’) and directions (“keep the big yellow buoys on your left …”) we tiptoed down the slipway to the water. The harbour side crowd gave us a countdown and we were off. Surviving the starting mêlée, I tried to draft another swimmer. When in open water, do as the open water swimmers do, to garble the song. Too slow! I wove around him and out into the estuary. The sandy riverbed below seemed to be moving at a decent rate. Looking up a few minutes in (“sighting”, in the parlance), there were a reassuring number of red swim-hats around but no-one to draft. Head down again and the sandy river bottom gradually disappeared from view as the light green water darkened and cooled across the central channel of the estuary. Occasional glances up showed the big yellow marker buoys off to the left. The riverbed once again came into view and I found myself next to another swimmer. We finished the last few hundred metres level with one another and swam through the shallow water without the competitive sprint that would, of course, have been obligatory between lanes in a pool-based Masters Swim Session. Wading out of the shallows, we crossed the narrow beach to a victory walk up the packed slipway and out into the carnival atmosphere on the harbourside. It felt like the end of a Tour De France leg with stalls for free hot chocolate, pasties (Rick Stein’s! ), tee-shirts, a world away from the little medals you receive from an official at a trestle table at a Masters Swim Gala. Masters Cheerleaders… could it take off? Four of us set off on the swim and four of us finished. Between us we raised £1748 for Marie Curie, and we’d all like to thank those who very kindly supported us. We were all delighted to have completed it. Roll on 2016!